Astoria has its fair share of yogurt places – some are easy to forget, and some we really love. 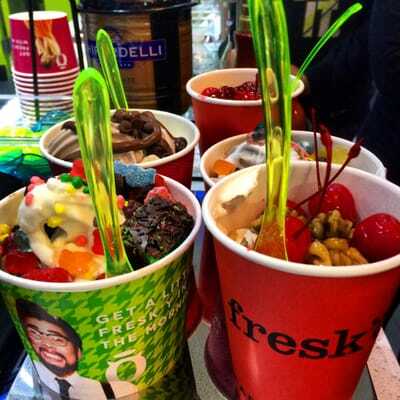 If we’re really craving frozen yogurt, one of our favorite spots is Fresk’o, at 31-19 30th Ave. According to their website, Fresk’o is family owned by the Prentzas, and they’ve been making yogurt for more than 75 years…which is a pretty long time to be making yogurt. Now, we know what you’re thinking “Everyone has frozen yogurt. Come on, Give Me Astoria,” but really – is too much frozen yogurt that bad of a problem? We like Fresk’o for a few reasons. They tend to have some pretty good flavors, and they rotate out flavors regularly, so you can plausibly try a new one every time you go. We also like that they have tea, coffee and cappucinos – so there’s more options than just yogurt. There’s the classics like vanilla and nutella, but there’s some really unique flavors that are growing on us, like Georgia peach and salted caramel popcorn. They also have a larger variety of toppings than some other places we’ve seen, like sour patch kids, animal crackers, Andes mints, and chocolate covered peanuts – so you just can’t resist filling up your cup to the very top. Another reason we love Fresk’o is that it’s not…kitschy. There’s a different vibe to Fresk’o than some of the other yogurt places in the neighborhood – it’s a little more grown up, a little more sophisticated. It’s a cute date spot where you won’t feel surrounded by a younger crowd of teenagers. The decor here is pretty interesting – everything from crisp black on white sign outside, to the lit up doorway and interior, to the funky green tables outside. We can definitely see Fresk’o being a cute after-date-night spot, or somewhere relaxing to pop in to when you’re trekking down 30th. 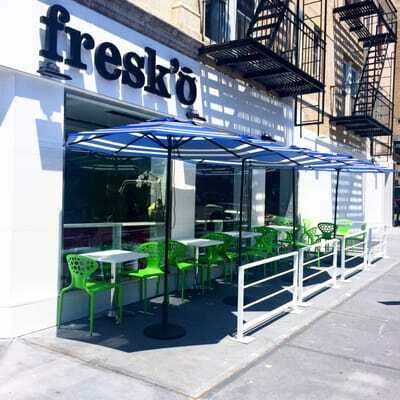 You can visit Fresk’o at 31-19 30th Ave or check out their website! Previous articleWin Two Astor Room Giftcards! King for a reason: Astoria’s King Souvlaki expands to Bay Ridge!